BGO imaged NGC 3384 for me. A galaxy, with friends, in Leo. One of the RASC Finest NGCs. What an image. There's a little bit of everything in here. That's Messier 105 (M105) at the 4 o'clock (west-south-west) position, big and bright, and NGC 3389 at 7 o'clock (south-south-east), classic spiral. It's curious to me that the two NGCs were not included in the Messier list. NGC 3384 does not appear to be a spiral. And it does not seem to be an elliptical (like the classic M105). SkyTools 3 Pro says it is a lenticular. aka MCG 2-28-12 and PGC 32292. M105 is also known as NGC 3379, MCG 2-28-11, and PGC 32256. The small spiral 3389 is aka MCG 2-28-13 and PGC 32306. There's an interesting arrangement of three stars to the north-west of the centre galaxy. It looks like a triple star system but SkyTools does not identify them as such. ST3P only shows the single star J104755.4+124329 in this location. ST3P says they are unrelated. If I hadn't know it was there, I would have missed it. Quasar NGC 3384 U4 is barely visible between GSC 00852-1189 (possibly magnitude 13.10) and J104749.7+124451 (mag 17.72). ST3P says the quasar mag is 18.9. ST3P says reports the redshift (z) at 1.11 and light time at 7.0 Gyr. There's a faint amorphous fuzzy, LEDA 1414181, west-north-west of NGC 3384, between stars J104802.7+124015 and GSC 00852-0810. LEDA 1410090 is due south of the target galaxy, forming a diamond with 3 stars including J104823.3+122802. Small, slightly oval. 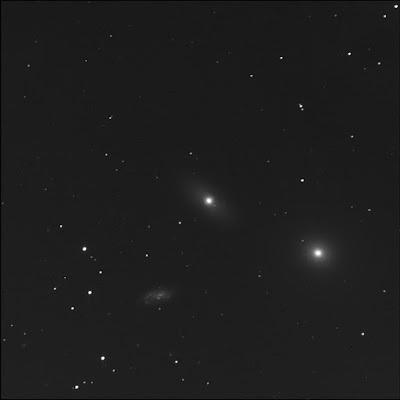 LEDA 1410190 is north-west of J104823.3+122802. Round, brighter than 1410090. LEDA 1410893 is east of the spiral. Faint, small, nearly round. LEDA 1410257 is south-west of the 3384, well away, at the left edge of the image frame, near the triangle of stars including J104900.6+122920. I like the grouping of stars including TYC 00852-1098 1 east of NGC 3389. The faint pair of stars including J104845.0+123405 is not identified as a double in ST3P. LEDA 1412396 is a faint oval east of star GSC 00852-0787. Star GSC 00852-1132, north-east of 3384, appears to have a faint companion. This does not show in SkyTools.